The New Year is a good time to reassess your business and in particular, your finances, so that you can put any necessary changes in place before the new financial year starts in April. Here are seven tips to help you revamp your finances and forge ahead into the New Year with a healthier balance sheet. While banks still control much of the business finance market, they are far from the only option—and bank investment can be very hard for small businesses to secure. So, if you’re looking for money to invest in your business, investigate all the options. Consider crowdfunding and peer-to-peer lending. While not all funding types will suit your particular business, with research, you will find one that will. Independent websites like the British Banking Insight or the FSB’s FCA-regulated online funding platform can help you find suitable options. Local authorities and local or industry-specific business groups sometimes offer loans and grants too, and if you want funding for an eco-friendly initiative, Small Businesses: Get a Grant for Going Green looks at some of the green grants and loans available. Overdrafts and credit cards can be useful as a buffer, especially in the early days of your business, but don’t be tempted to use them for investment funds unless what you’re purchasing is absolutely crucial to your business and you have no other means to fund it in the time available. Exceeding your agreed limits can soon rack up significant amounts of interest, and you don’t want to spend all your profit paying it off! It can also harm your credit rating and your chance of getting funding in future. Many of the cash flow problems suffered by small businesses concern late payments. To minimise the risk, always check the financial background of companies asking for credit or placing large orders. Make your payment terms and the penalties for not meeting them clear on all contracts and invoices (you can charge both a debt reclamation fee and statutory interest on unpaid invoices; the FSB have a guide for calculating this). Invoice swiftly and send a reminder before the due date (and another immediately after the due date if the invoice remains unpaid). Free accountancy or invoicing software is available to track invoices, alert you when they’re unpaid and issue reminders to debtors automatically. To react to opportunities and make the right decisions for your business, you need to have your latest financial data at your fingertips. Getting a clear idea of your current financial position should be the work of a few clicks and less than a minute, not a weekend of searching for receipts and invoices in your glove box and down the back of the settee before entering them all in an Excel spreadsheet. Filing your paperwork regularly is essential, and entering details into your accounting system straight away is even more important. Modern digital accounting software makes it simple to keep on top of your finances, and if you opt for a cloud-based service, you can access your real time financial data anytime, anywhere, providing you have an internet connection. There’s a range of low cost options for cloud accountancy software, such as Pandle, which is free (and super simple to use). Keeping track of invoices and expenses, and sending out payment reminders, becomes a simple and automated task—and potential investors can be shown up-to-date financial figures on which to base their decisions. Plus, with Making Tax Digital on the horizon, getting used to keeping digital accounts and filing your tax returns online is a very prudent move. So, for the success and financial security of your business don’t wait until the end of the month (or even, heaven forbid, the year) to get on top of your finances. If you lack the time or the expertise, get an accountant to do it for you! If you’ve just got into profit, resist the urge to spend it all on the business or pay yourself a bonus. Save it in case of unexpected expenses, such as equipment failure, and expected expenses like your tax bill! Only think about putting profits to use when you have a very comfortable financial buffer. It’s amazing how many small business owners admit to spending ages searching for the best deal for their personal car insurance, mobile, house insurance and energy supply, but just sign up to the first thing offered when it comes to business bills (or continue with the existing energy supplier at a new premises). An hour or two researching the best deals for everything from business mobiles to public liability insurance could save you hundreds (even thousands) of pounds. Mark renewal dates in your diary to ensure that before energy contracts, mobile contracts and insurance policies expire, you’ve already researched the best deal to go with next. Sadly, loyalty is rarely rewarded these days and most companies won’t offer you their best deals or tell you about cheaper available rates, especially if you don’t ask! They’ll just let you carry on paying over the odds via your existing direct debit. The best deals are often found by swapping to new suppliers (or challenging your existing ones!). A smart meter to keep an eye on energy consumption can be useful, and as lightbulbs and other electrical items fail, replace them with energy-saving alternatives, simultaneously saving you money and helping to save the planet. If your business is new, hopefully you’ve done your research on any costs you foresee. If you’re running an established business, you should have an idea of the costs you can expect. In either case, this information should be used to draw up monthly and yearly budgets for your business, so that you’re not overspending in any area but have enough funds available for marketing or investment in new equipment etc. It’s important to stick to personal and business budgets, and to keep business and personal expenses separate. However tempting it may be to buy something for your business out of your own money, resist. You need a clear idea of how your business is doing and it must thrive or fail on its own terms. 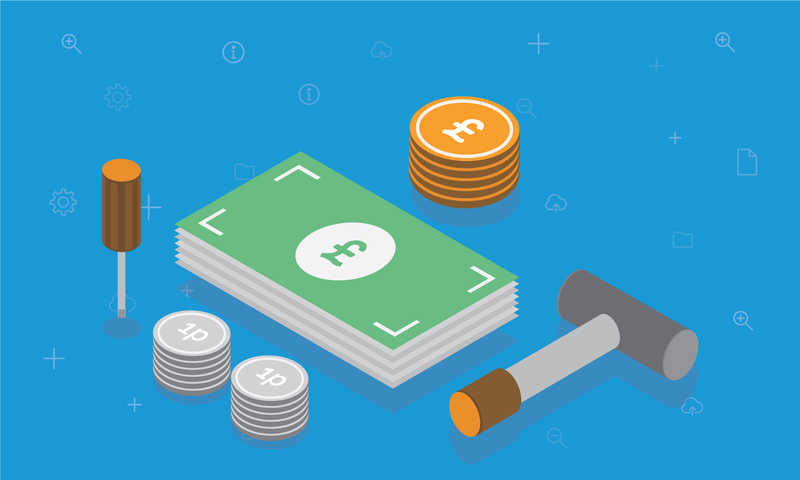 Injecting cash directly or via purchases or bill payments muddies the waters and makes it hard for you, an accountant, a potential investor or HMRC to see the true turnover and profit of your business. It’s worth ensuring your personal credit score and finances are healthy too, as potential investors may want to see the personal financial status of the directors or partners in a small business. A long-term business plan shouldn’t be set in stone, as none of us can see the future. Circumstances, staff, costs, the economy and the market change, and that means that your business plan will need to as well. Review your business plan and see if it’s still realistic and suitable for the needs and present position of your business. If your business has done significantly better or worse than you expected, it will need a rewrite. What’s selling? What’s not? How you could expand and capitalize on your success? Do you need to wind down some areas of your business that aren’t proving that profitable, focusing on the areas that are? Which of your marketing initiatives is getting results? Don’t keep sinking money into marketing avenues that aren’t working for you. It’s easy, for instance, to ignore that standing payment to the local newspaper and let money quietly slip out of your account every month, paying for an advert that, as far as you can tell, brings very few customers to your door. If most customers tell you they saw an advert for your business on social media or an online directory, focus your efforts (and your money) there. Your business should feel financially healthier after this New Year check-up, but don’t let things slide. Keep an eye and a tight rein on your finances, and review the financial position of your business throughout the year. Don’t wait until next New Year! Cloud accounting software such as Pandle can help you keep on top of your finances and manage expenses with ease. Take a look at our range of handy features.